Diagnodent aids in the detection of caries on the occlusal surface (biting surface) of the tooth. Diagnodent uses laser technology to detect and quantify hidden or sub-surface caries by measuring laser fluorescence within the tooth structure. Even very small lesions are detected at the earliest stage, enabling the tooth surface to be protected and preserved. The laser detection removes the doubt from treatment decisions regarding hidden caries or questionable stained grooves. It allows the treatment of sub-surface caries with confidence. 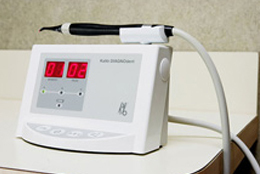 The diagnodent digital system is used to detect cavities that cannot be seen with the human eye. By placing this wand on the tooth we are able to detect areas of decay below the tooth surface. This is another way of providing exceptional care for our patients.